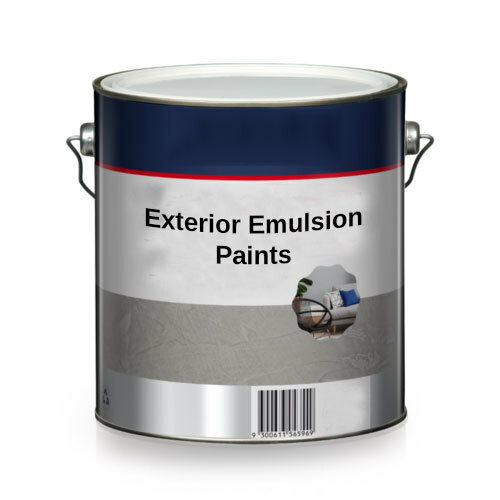 In order to cater the variegated demands of our precious clients, we are offering an excellent quality range of Exterior Emulsion Paints. Established in the year 1991, at Pune (Maharashtra, India), we “Paintwel Industries” are engaged in Manufacturing and Supplying of an optimum quality grade ofWater-Based Paints, Paint Coating Primers, Exterior and Interior Paints, Epoxy Paint, Aluminum Paint, Etc. The paints provided by us are processed in compliance with industry quality standards utilizing excellent grade chemical compounds and ultra-modern technology under the strict direction of our enthusiastic professionals. Apart from this, the chemical compounds that we use to process these paints are sourced from quality oriented and reputed vendors of the market in adherence with market quality standards. Our offered paints are highly appreciated all across the nation owing to their indispensable attributes such as like environment-friendliness, balanced composition, enhanced shelf life, free from impurities, waterproof, quick drying hygienically packed, non-toxic smell, purity, weather resistance, etc. In addition to this, we provide these paints to our esteemed clients in a variety of colors and excellent quality packing material at pocket-friendly prices within the estimated time period. Our team of quality analysts examines the offered paints on various measures of quality in order to avoid any type of discrepancy.